I can't believe I got through my first TGF DT release! I already love being part of this great team. I am all ready for a big 2014, how about you? Today is not only the start to a fab new year on the Farm, but it's also our JANUARY RELEASE DAY! We are ringing in 2014 with Miss Anya Night Out, Frou Frou Believe, and Sweet Bean…all available in the TGF STORE now! This is of course, in addition to our 5 new team members. So exciting! Thanks so much for such a swell start as preview week was a huge success and super fun, too! Now…the minute you've all been waiting for…. One lucky winner who visits all of the DT's blogs, comments, and comes back here letting us know they did will take home the ENTIRE JANUARY RELEASE! For my release day card I had to use the last Miss Anya that I haven't featured yet. I wanted to make her look classy and sophisticated like she was about to go on a fabulous "night out"!! I didn't realise how hard it was to take a photo when the card uses acetate. I used clear acetate with a black damask design over black glitter cardstock. I think I took about 15 photos to get it right!! Unfortunately you can't see the sparkle in Miss Anya's dress on this one so took a closer photo on an angle below. Here is a close up of the image to see the sparkle on her dress. I used a silver Wink of Stella pen. I think the sparkle turned out more gold than silver but she still looks ready for a night out on the town for her birthday!!! KRISTINA DISHON - You are here!! You have until NOON CST on 1/2/14 to complete the hop and enter to WIN! Winner will be announced tomorrow on our FACEBOOK page, so stay tuned! HAPPY NEW YEAR 2014 from all of us on the Farm! Very pretty card, the sparkle looks stunning! Oh my gosh, she is adorable I just love her sparkling dress. This is just too cute for words even! Love it! Hugs! Hugs and a Happy New Year! Great technique. Love the color of the hair too. WoW O WoW.....This card is Beautiful I loveeeeee it! Great job! It's a beautiful and elegant card. Love it and love the stamp! Gorgeous card. The glitter dress is perfect. 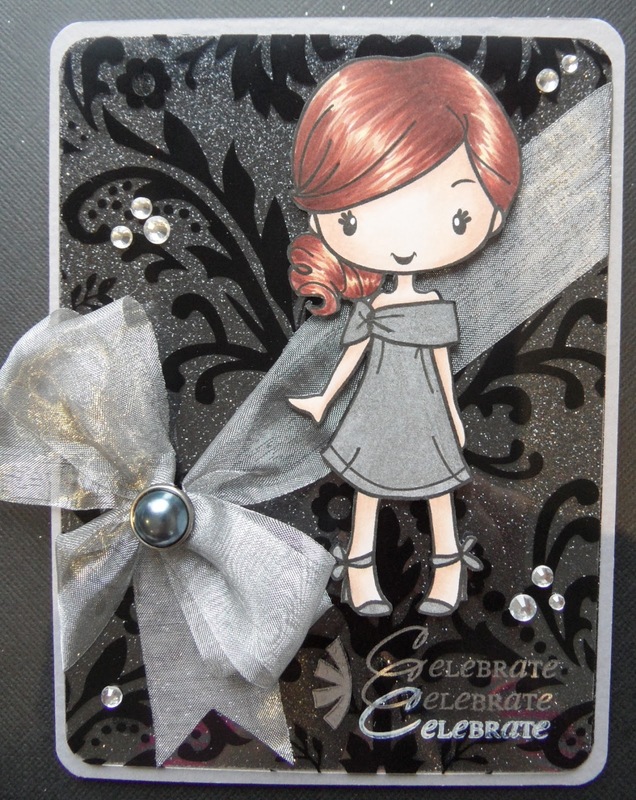 Beautiful card, love the sparkle! Love your card! So elegant yet cute!! A perfect New Years card and love the sparkle. Very classy--love the sparkle on her dress. What a darling image and lovely card. So sparkly... and cute! Very elegant! I love her sparkly dress and pretty red hair. Congrats on your first blog hop as a DT member! Happy 2014! Love your color choices. Your card is so elegant. .
Wow, so chic!! Love your fantastic card! Such an stylish dress and a very elegant card. 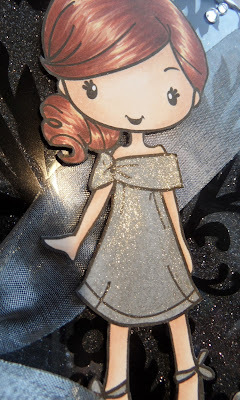 Oooh...that silver wink is fantastic for her dress. Love the sparkle. I think I had a dress like that. LOL!! Awesome card! Stunning. This card is absolutely amazing. I think you acheived the look you were going for...classy and sophisticated. Beautiful card, love the glittery silver dress and detailing in the card! Love the way the Wink of Stella pen looks! So pretty! i LOVE your coloring on the hair and LOVE the glitter on her dress!!! I just love your "New Years" card! The Sparkles are Spectacular! Oh my goodness! So glamorous! Love it! Love the red hair since I'm a red head. I love how you made her dress sparkle! FFF - Red, White and Blue! FFF - Love is in the Air! FFF - Bling it up! Farm Fresh Friday - Clean & Simple!